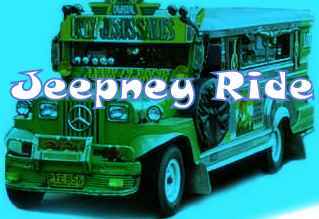 Jeepney Ride: Drivers are Sweet Lovers? There is a saying that "Drivers are sweet lovers" and I don't know if it is true or not. Though for several years already of being a passenger in a public vehicle like jeepney, I had been able to meet drivers who had always been asking personal questions. I hate it but I don't want to be mean to them. They would ask your name, your occupation, where do you live and sometimes even your cellphone number. It is annoying that sometimes I gave a different name or different number. It is like as if they are looking for a lover. I might be wrong and maybe they are just bored and would like to have someone to talk to while driving the jeepney. Well, I don't know why they behave like these, but is this the characteristic of a sweet lover?. It is for you to judge. hahaha.. nranasan mo din pla KM..
i used to encounter drivers like that way back in college and i was studying somewhere in the university belt. i just tried to brush them off as politely as I could, hehe..
Not all of us ! The Almighty has his own purposes.